"You know if there is an improvement in public service in the airport, one is that there will be no more inspection for bags that come in." It is a statement from President Rodrigo Duterte following another incident of the alleged baggage pilferage at the Ninoy Aquino International Airport (NAIA) that victimizes the passengers especially the overseas Filipino workers (OFW). The president said that he would prefer minimizing human contacts in checking and screening of the baggage. President Rodrigo Duterte said Thursday bags of travelers will no longer be opened during airport screening and "human contact" would be minimized. The President then made a joke about how bringing in contraband like dynamite, bullets, and marijuana would be okay, but that the police and the members of the Philippine Drug Enforcement Agency (PDEA) would be waiting for them outside the airport. He also said that there would be no more human contact in airport immigration. By this, he was most probably referring about the newly installed eGates at the airport which is now operational. he said. Duterte said that in his years as a public servant, he has seen how poorly the overseas Filipino workers are being been treated. He recalled one instance where he witnessed an OFW who arrived from Hong Kong with a small TV being charged a fee the OFW could not afford. The President said he nearly got into a fight with the airport personnel over the way the OFW was treated. 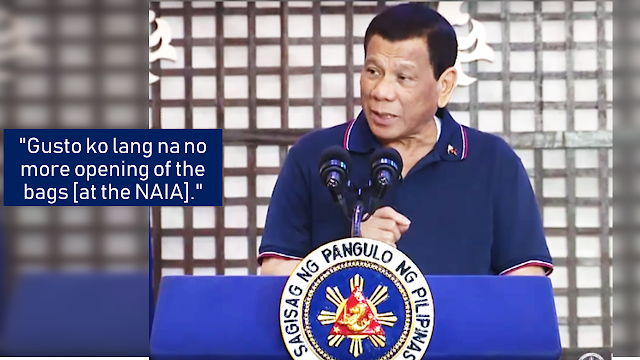 The president also reiterated that he does not like any form of oppression among the Filipino people, especially on his presence.